Many people are hesitant to begin investing in their 401(k) plans because they are worried about how it will affect their take-home pay. Your take-home pay may not be greatly lowered when you increase the amount you contribute each month. One of the easiest ways to increase the amount you contribute is each time you are given a raise, you can raise the amount you contribute and you will not even notice it in your take-home pay. You should invest up to your employer's match even if you are focused on getting out of debt or saving for a house. This is money that you are simply passing up that can greatly affect your future. If you do not save now, you will not be able to retire as soon and you may struggle in your retirement years. It is important to realize that contributions that are made to a traditional 401(k) are made on a pretax basis. That means that your taxable income is lowered, and so the amount you pay in taxes is lowered. So you pay fewer taxes, and your take-home pay will not be affected by the same amount you contribute. It may decrease slightly, but not by much. Some companies have stopped offering an employer match, but it is still important to continue to contribute to your 401(k). Five percent is a good starting point if you are not receiving an employer match. This begins your retirement savings, and then you can use the rest of your money to get out of debt. Once you have done this, you should increase your retirement savings to fifteen percent of your income. The money you contribute now will grow exponentially over the years, and it is important not to waste this extra time you have to grow your retirement savings. Think about the long-term benefit of investing in your retirement that will make life easier in the future. Focus on contributing regularly. The market will go up and down, but if you continue to invest you should be in a comfortable place when it comes to retiring. A traditional 401(k) is a good option because it can reduce the amount you pay in taxes now, which may make it easier to continue investing when money is tight. If you have the option of a Roth 401(k), your contributions will directly affect your take-home pay. This is because the contributions are made with after-tax dollars. 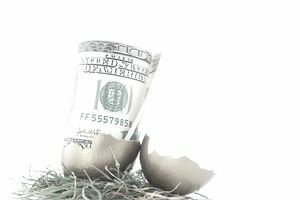 The biggest advantage of the Roth 401(k) is that the earnings are not taxable. This can end up saving you a lot in taxes once you have hit retirement. You should consider taking advantage of a Roth 401(k) if your company gives you this option. You will need to adjust your budget accordingly. However, it does mean that the amount you contribute will be taken directly from the amount that you would otherwise take home. This is similar to a Roth IRA because the contributions will not reduce the amount that you pay in taxes each year. However, the benefit of not paying taxes on your earnings can pay off once you are in retirement age. It is something to carefully consider if your employer offers a Roth 401(k). A Roth 401(k) allows you to avoid taxes on your investment earnings. This is a good option if you are not worried about lowing your taxable income. If your company does not offer a 401(k) plan or if you have to wait for a year to begin participating, you should still be saving for retirement. You can do this by setting up a Roth IRA account through a brokerage firm or a bank. The money should be invested in mutual funds, and you can sign up for a company who will accept monthly contributions without a fee. This will get you started saving for retirement right away. Remember that investing for retirement is one of your top priorities. It is essential so that you can make it in the future. Careful planning and steady contributions will help you to be able to retire comfortably. You should regularly invest in retirement, even if it means that you have to scrimp a little bit more at home then you did before you started contributing to retirement. The sacrifices you make now will prevent you from making difficult decisions once you retire. You may want to consider other investments if you max out your allowable 401(k) contributions. If you are uncertain about how to start investing for retirement on your own, you can talk to a financial adviser who can take you through the steps and help you set up an account. When you are young, more aggressive and riskier investments can help you earn more. As you get older, you should move to more conservative investments that are safer since you will not have enough time for the economy to cover if it goes through a slump. Try not worry about your investments too much once you have made them.